CD79a and CD79b function as transducers of B cell antigen receptor signals via a cytoplasmic sequence, termed the immunoreceptor tyrosine-based activation motif (ITAM). ITAMs contain two conserved tyrosines that may become phosphorylated upon receptor aggregation and bind distinct effectors by virtue of the distinct preference of phosphotyrosyl-containing sequences for SH2 domains. To explore the function of CD79a and CD79b ITAM tyrosines, we created membrane molecules composed of MHC class II I-Ak extracellular and transmembrane domains, and CD79a or CD79b cytoplasmic domains in which one or both of the ITAM tyrosines were mutated to phenylalanine. Functional analysis revealed that both ITAM tyrosines are required for ligand-induced Syk phosphorylation. However CD79a-ITAM and CD79b-ITAM tyrosine phosphorylations were asymmetrical, with >80% of phosphorylation occurring on the N-terminal tyrosine (Y-E-G-L). Thus, these findings suggest that following receptor ligation, only a minor proportion of phosphorylated ITAMs are doubly phosphorylated and thus can engage Syk. Only the N-terminal ITAM tyrosine of CD79a was required for ligand-mediated phosphorylation of the receptor and a subset of downstream substrates, including p62, p110, and Shc, and for Ca2+ mobilization. However, responses mediated through CD79b exhibited a greater dependence on the presence of both tyrosines. Neither tyrosine in CD79a or CD79b appeared absolutely essential for Src family kinase phosphorylation. These results indicate that phosphorylations of the tyrosines in CD79a and CD79b occur with very different stoichiometry, and the respective tyrosyl residues have distinct functions. The B cell Ag receptor (BCR)2 is a hetero-oligomeric complex composed of membrane Ig (mIg) and products of mb1 and B29 genes encoding CD79a (Igα) and CD79b (Igβ), respectively. Aggregation of BCR by Ag results in tyrosyl phosphorylation and/or activation of many proteins, including CD79a and CD79b (1, 2, 3) and protein tyrosine kinases (PTKs) of the Src, Syk, and Tec families (4, 5, 6, 7, 8, 9, 10). Activation of PTKs leads to phosphorylation of other molecules, including Vav, PLCγ, and Shc (11, 12, 13, 14, 15, 16, 17). These effectors mediate downstream signaling leading to cell proliferation, differentiation, and/or apoptosis. The CD79a-CD79b heterodimer is an important part of the receptor complex. These B cell-specific glycoproteins are required for transport of mIg to the cell surface (18), and they also transduce signals initiated by BCR aggregation (1). This latter function can be ascribed to the ITAM, a motif found within the cytoplasmic domain not only of CD79a and CD79b, but also of the ζ-chain of TCR; γ, δ, and ε of CD3 components; β and γ subunits of FcεRI; and FcγRIIA (19, 20). Although conservation of this motif in immune system receptors was recognized in 1989 (19), the signaling potential of ITAMs, specifically those of TCR-ζ and FcεRIγ chains, was only demonstrated by a series of studies in 1992 (21, 22, 23). Mutational analyses further delineated the signaling function of the motif itself and revealed that the two motif tyrosines and the third residue carboxyl to each tyrosine (Y+3) are critical for ITAM-mediated signaling leading to certain biologic responses (24, 25, 26). To study the signaling function of CD79a and CD79b, several groups created chimeric molecules consisting of the ITAM-containing cytoplasmic tail of CD79a or CD79b and extracellular and transmembrane domains of other surface molecules, such as CD8 (27, 28), FcγRII (29), mutated mIg (30, 31, 32), and platelet-derived growth factor receptors (33, 34). Using this approach, the ability of CD79a and CD79b to signal independently was demonstrated. Subsequent studies have begun to define the function of the tyrosyl residues within CD79a and CD79b. Sanchez et al. (31) showed that an mIgM/CD79b chimera bearing a mutation in the C-terminal ITAM tyrosine (Y206) could no longer mediate either Ca2+ mobilization or protein tyrosyl phosphorylation. This finding was extended by Williams et al. (32), who showed that a similar chimera mutated at the N-terminal CD79b-ITAM tyrosine (Y195) or at both Y195 and Y206 failed to elicit phosphorylation of cytoplasmic proteins. Together, these data suggest that CD79b requires both ITAM tyrosines to function. A similar study of CD79a-ITAM tyrosines in CD8-CD79a chimeras by Flaswinkel and Reth (35) also suggested the requirement for both CD79a-ITAM tyrosines in protein tyrosine phosphorylation and Ca2+ mobilization. However, using the J558L myeloma model, this group developed evidence that in the intact BCR, CD79a tyrosines may function differently in signaling. These results appear to differ from those of the study of CD8 chimeras, and it was assumed in this study that the wild-type CD79b present in the reconstituted BCR did not contribute to the signaling observed. Thus, the relative function of ITAM tyrosyl residues is unclear. ITAMs transduce signals largely by virtue of their tyrosyl phosphorylation and subsequent interaction with SH2 domain-containing proteins. Screening of phosphopeptide libraries has revealed that SH2 domains of Src family kinases Src, Fyn, Lck, and Fgr preferentially bind the sequence Y-E-E-I (36). This resembles the N-terminal sequence Y-E-G-L, and particularly the C-terminal Y-E-D-I, found in both CD79a- and CD79b-ITAMs. Indeed, binding of phosphorylated CD79a- and CD79b-ITAMs to Src family kinases has been well documented (37, 38, 39, 40). In addition, the CD79a-ITAM sequence L-Y182-E-G-L is predicted to be a preferred substrate of Src family kinases Lyn and Blk (41). Taken together, these findings predict that a Src family kinase may phosphorylate the N-terminal CD79a ITAM tyrosyl residue initially, creating a binding site for SH2 domains of Src family kinases (and other effectors). Binding of Src family kinases to phosphorylated ITAMs via their SH2 domains may be an important kinase activation/signal amplification step, as phosphorylated ITAMs can activate Src family kinases in vitro (40). Src family kinases with mutated SH2 domains that can no longer bind to phosphotyrosyl residue also do not function normally in signal transduction (42). Since ITAM tyrosines are typically found in different amino acid contexts, they could potentially be substrates for different kinases and recruit different SH2 domain-containing proteins to the phosphorylated receptor complex. The potential biologic importance of differential ITAM tyrosyl phosphorylation and effector recruitment was illustrated by the finding that TCR antagonists and agonists induce different patterns of TCR-ζ phosphorylation (43, 44). To further examine the function of ITAM tyrosines in CD79a and CD79b, we constructed chimeric molecules containing the extracellular and transmembrane domains of MHC class II I-Ak and the cytoplasmic domain of either CD79a or CD79b. In these chimeras, CD79a is linked to I-Akα (designated I-AIgα), while CD79b is linked to I-Akβ (designated I-AIgβ). Similar constructs bearing mutations at either one or both ITAM tyrosyl residues were generated (designated I-AIgαF182, I-AIgαF193, and I-AIgαF182/193 for a mutation(s) in CD79a, and I-AIgβF195, I-AIgβF206, and I-AIgβF195/206 for a mutation(s) in CD79b). Analysis of signaling by these chimeras indicates that ITAM tyrosines may not be absolutely required for receptor-mediated tyrosine phosphorylation of Src family kinases, but both are required for Syk phosphorylation. In vitro, phosphorylation of tyrosyl residues in CD79a and CD79b was not symmetrical, with >80% of phosphorylation occurring on the N-terminal tyrosyl residue. In vivo, similar asymmetric phosphorylation of CD79a was observed. Most strikingly, the presence of the N-terminal tyrosine of CD79a-ITAM was sufficient to allow CD79a to mediate phosphorylation of a subset of downstream substrates and Ca2+ mobilization. However, both ITAM tyrosines were required for most CD79b function. To prepare constructs encoding I-AIgα chimeric molecules, cDNA encoding the CD79a(Igα) cytoplasmic domain flanked by the 5′ StuI site and the 3′ EcoRI site was generated by PCR using construct containing the cytoplasmic domain of Igα in a pGEX vector (Pharmacia, Piscataway, NJ) as template (37). The PCR products were cloned into pCRII using the TA cloning kit (Invitrogen, San Diego, CA) and sequenced. The correct insert was subsequently used to replace the cytoplasmic domain of I-Akα, creating a chimeric cDNA encoding fusion of I-Akα and Igα. This construct was then shuttled into the EcoRI and BamHI sites of a modified mammalian expression vector pneoSRα (DNAX, Palo Alto, CA) containing the polylinker region of pBluescript SK (W. A. Jensen, unpublished observations). To make I-AIgβ chimeric molecules, the CD79b(Igβ) cytoplasmic domain flanked by the 5′ BamHI site and the 3′ EcoRI site was generated by PCR using a pGEX-Igβ cytoplasmic domain construct as template (37). The products were cloned into pCRII (Invitrogen) and sequenced. The correct insert was subsequently cloned into vector containing I-Akβ cDNA mutated previously to introduce a BamHI at the end of its juxtamembrane region, replacing the I-Akβ cytoplasmic domain. The I-AIgβ chimeric construct was then shuttled into mammalian expression vector, pCEP4 (Invitrogen), via HindIII and XhoI sites. The truncated I-Akα and I-Akβ molecules were made by cloning the EcoRV/StuI fragment of I-Akα into modified pneoSRα vector and the HindIII/BamHI fragment of I-Akβ into pCEP4 vector, respectively. Chimeras containing either one or two tyrosine to phenylalanine mutations in the ITAM of Igα and Igβ were made similarly; however, mutations were introduced by PCR using oligonucleotides containing the desired mutations and was confirmed by sequencing. Chimeric cDNA constructs were transfected into phosphorylcholine-specific IgM-, IgG2-, and I-Ad-expressing B lymphoma, M12.4g3r (V. Parikh and P. Tucker, University of Texas, Austin, TX) by electroporation. Briefly, cells were washed and resuspended in IMDM at 2 × 108/ml. Cell suspension equivalent to 1 × 107 cells was added to an electroporation cuvette (Bio-Rad, Richmond, CA), incubated with 2 μg of each I-AIg chimeric construct and truncated I-Ak cDNA at 4°C for 5 min, and electroporated at 320 V and 960 μFd. After chilling the electroporated cells on ice for 5 min, they were cultured for 36 to 48 h before addition of G418 (Life Technologies, Grand Island, NY; 2 mg/ml) and hygromycin B (Calbiochem, La Jolla, CA; 1000 U/ml) to select for transfectants. Colonies resistant to both G418 and hygromycin were then screened for surface expression of I-Ak by FACS analysis and sorted to enrich for the I-Ak-expressing population and, if necessary, to isolate cells expressing similar levels of chimeric receptor. Since I-Ak molecules are usually expressed as α and β heterodimers on the cell surface, I-Akα chimeras were always cotransfected with truncated I-Akβ and vice versa. Surface staining of cells was performed with cells at 2.5 × 106/ml in PBS and 0.2% azide with a 1/200–500 dilution of Ab (1 mg/ml) and incubated at 4°C for 30 min. Stained cells were washed three times in PBS and 0.2% azide before further staining with secondary reagent. Cells were loaded with indo-1/AM at 10 μM/5 × 106 cells/ml in balanced salt solution at 37°C for 1 h. After extensive washing, cells were resuspended in IMDM containing 3% FCS at 1 × 106/ml, and analysis was initiated. After establishing the basal intracellular free calcium concentration, cells were stimulated by addition of premixed 10 μg of biotinylated 39J (mouse mAb specific for I-Akα) and 20 μg of avidin (Sigma Chemical Co., St. Louis, MO) at 37°C, and monitoring of the intracellular free calcium concentration was resumed after about 30 s. Ca2+ mobilization was detected by flow cytometry using Ortho 50H (Johnson and Johnson, Westbrook, MA) with data analysis by Mtime software (Phoenix Flow Systems, San Diego, CA). Cells at 1 × 108/ml IMDM were mock stimulated with PBS or stimulated with either 1 μg F(ab′)2 of rabbit anti-mouse Ig heavy and light chains or 4 μg of 39J, a mouse mAb against I-Akα, per 1 × 106 cells at 37°C for 1.5 min. Cells were lysed in lysis buffer containing 1% Nonidet P-40, 150 mM NaCl, 10 mM Tris-HCl (pH 8.0), 2 mM sodium orthovanadate, 10 mM sodium pyrophosphate, 0.4 mM EDTA, 10 mM NaF, 1 mM PMSF, and 1 μg/ml each of aprotinin, leupeptin, and α1-antitrypsin. Lysates were centrifuged for 5 min at 12,000 × g at 4°C to pellet nuclei and other particulates. Cleared lysates were boiled with 2× reducing sample buffer for 5 min and analyzed by 10% SDS-PAGE, or were subjected to immunoprecipitation by incubation with specific Abs for 1 h at 4°C. Immune complexes were isolated by adsorption to protein A- or protein G-Sepharose beads (Pharmacia) for 30 min at 4°C. Beads were washed four times with 0.5% Nonidet P-40 lysis buffer and boiled in 2× reducing sample buffer for 5 min. These samples were subsequently fractionated by 10% SDS-PAGE followed by electrophoretic transfer to polyvinylidene difluoride (PVDF) membranes. The immunoblots were blocked with 5% BSA in Tris-buffered saline (TBS; 10 mM Tris (pH 8.0) and 150 mM NaCl) for 1 h at room temperature, then incubated with anti-phosphotyrosine Ab Py54 (Oncogene Science) at a 1/500 dilution for 1 h. After incubation, the membranes were washed four times, alternating TBS and TBS plus 0.05% Triton X-100, and further incubated with horseradish peroxidase-conjugated rat anti-mouse IgGγ1 (Zymed, San Francisco, CA) at a 1/500 dilution in 5% nonfat milk for 30 min at room temperature. The blots were then developed using an enhanced chemiluminescence (ECL) kit (Amersham, Arlington Heights, IL) according to the manufacturer’s instructions. To quantitate the amount of proteins in the immunoprecipitates, blots were stripped of Abs by incubation in stripping buffer at 56°C for 30 min as indicated in the ECL kit and washed extensively with TBS or TBS containing 0.05% Triton X-100, alternatively. These membranes were then processed as before and probed with specific Abs as indicated. CD79a(Igα) or CD79b(Igβ) ITAM-GST (wild-type or various Y to F mutated) constructions were generated, and fusion proteins were produced as previously described (38). Following extensive washing with 1% Nonidet P-40 lysis buffer, 25 μl of fusion protein-saturated glutathione Sepharose (Pharmacia) adsorbates were washed twice with in vitro kinase buffer (10 mM HEPES (pH 7.0), 10 mM MgCl2, 2 mM sodium orthovanadate, and 1 mM PMSF), resuspended in 100 μl of kinase buffer containing baculovirus-produced Fyn or Lyn PTK (40) and 10 μCi of [γ-32P]ATP (New England Nuclear-DuPont, Boston, MA), and incubated overnight at room temperature with constant mixing. Phosphorylation reactions were terminated by washing followed by addition of reducing Lammlei sample buffer. Proteins were fractionated by 10% SDS-PAGE, electrophoretically transferred to a PVDF membrane (New England Nuclear-DuPont), and detected by autoradiography. Sites of phosphorylation were determined as previously described (45). Briefly, 32P-labeled proteins prepared as described above, were excised from the PVDF membrane, soaked in 0.5% PVP-360 (Sigma) in 100 mM acetic acid for 30 min at 37°C, and washed several times with H2O followed by 0.05 M NH4HCO3. Washed membrane slices were incubated overnight at 37°C with 20 μg of thermolysin (Boehringer Mannheim, Indianapolis, IN), added in two 10-μg aliquots 6 h apart, in 500 μl of 0.05 M NH4HCO3. The digestion was terminated with the addition of 500 μl of H2O. Cleaved peptides were dried completely in a Speed-Vac (Savant, Farmingdale, NY) and oxidized with performic acid. Total yield was estimated by Cerenkov counting. Samples were resuspended in a small volume of pH 1.9 buffer (2.5% formic acid (88%) and 7.8% glacial acetic acid in deionized H2O), and 2500 counts of each was loaded on individual thin layer cellulose plates (Merck-EM Science, Gibstown, N.J.). The first dimension (electrophoretic separation) was run at 1.8 kV for 20 min in pH 3.5 buffer (0.05% glacial acetic acid and 0.5% pyridine in deionized H2O). The second dimension (chromatographic separation) was run for 16 h in isobutyric acid chromatography buffer (62.5% isobutyric acid, 1.9% n-butanol, 4.8% pyridine, and 2.9% glacial acetic acid in deionized H2O) for CD79a and phospho chromatography buffer (37.5% n-butanol, 25.0% pyridine, and 7.5% glacial acetic acid in deionized H2O) for CD79b. Separated 32P-labeled peptides were detected by autoradiography. Maps generated from fusion proteins containing various tyrosine to phenylalanine mutations were compared with those generated from wild-type ITAMs. Based on these comparisons, 32P-labeled spots were assigned as being derived from specific tyrosines. Preliminary to analysis of the function of ITAM tyrosyl residues, we compared the ability of wild-type CD79a and CD79b to transduce signals when expressed as single chain receptors. Chimeric molecules composed of extracellular and transmembrane regions of MHC class II molecule I-Aα and I-Aβ chains directly fused to the cytoplasmic domains of CD79a and CD79b, respectively, were generated (Fig. 1⇓). Since MHC class II molecules are expressed as heterodimers at the cell surface, cells were transfected with truncated I-Akα and I-Akβ, lacking their cytoplasmic tails (designated I-Atr), chimeric molecule I-AIgα paired with tail-less I-Akβ (designated I-AIgαwt), or chimeric molecule I-AIgβ paired with tail-less I-Akα (designated I-AIgβwt). After drug selection, cell lines expressing similar levels of chimeric receptors were isolated by FACS. Polyclonal lines were used for experimentation rather than clones to avoid potential artifacts resulting from clonal variation. Shown in Figure 2⇓ is a FACS analysis illustrating expression of the transfected molecules. Both wild-type CD79a and CD79b containing chimeric receptors were competent to mediate signal transduction as judged by Ca2+ mobilization (Fig. 3⇓). Since aggregation of either I-Atr or endogenous I-Ad failed to elicit this response, cytoplasmic domains of CD79a and CD79b, but not extracellular or transmembrane domains of MHC class II molecules, are responsible for the signaling property of the chimeras. These data are in accordance with previous studies that have demonstrated the ability of CD79a and CD79b cytoplasmic domains to mediate signal transduction (27, 28, 29, 30, 31). Schematic diagrams of I-AIgα and I-AIgβ chimeric receptors. The numbers indicate the stretch of amino acid residues found in the wild-type α- and β-chains of MHC class II, I-Ak, and CD79a and CD79b that are encoded by the chimeric cDNA constructs. ITAM tyrosines in CD79a, Y182, and Y193 and those in CD79b, Y195, and Y206, are also indicated. FACS staining of cell lines expressing various chimeras. The parental cell line, M12.4g3R, and cell lines transfected with truncated I-Aα and I-Aβ (I-Atr), wild-type or mutated I-AIgα paired with truncated I-Aβ (I-AIgαwt, I-AIgαF182, I-AIgαF193, I-AIgαF182/193), and wild-type AIgβ-mutated I-AIgβ paired with truncated I-Aα (I-AIgβwt, I-AIgβF195, I-AIgβF206, I-AIgβF195/206) were stained first with biotinylated anti-I-Akα, 39J, anti-I-Akβ, 10.3.6, anti-I-Ab/d, D3.136, or anti-Igκ, 187.1 (at 5 × 105 cells in 200 μl of PBS and azide with a 1/200 dilution of the Ab), followed by streptavidin-FITC (1/200 dilution). Endogenous receptor expression was determined by anti-Igκ staining. Isometric displays of calcium mobilization. Cells expressing chimeric receptors were loaded with indo-1/AM and analyzed by Ortho 50H. After establishing a basal level of intracellular Ca2+, cells were stimulated with a mixture of 10 μg of biotinylated 39J (anti-I-Ak; right column) and 20 μg of streptavidin at 37°C for 15 to 30 s, and the change in the intracellular free Ca2+ concentration after stimulation was monitored for approximately 10 min. In parallel experiments, the cells were stimulated with anti-Igκ Ab, 187.1 (for BCR stimulation; left column), or a mixture of 10 μg of biotinylated anti-I-Ad Ab, D3, and 10 μg of streptavidin (for I-Ad stimulation; middle column) to determine the ability of cells to signal through endogenous BCR and MHC class II, respectively. 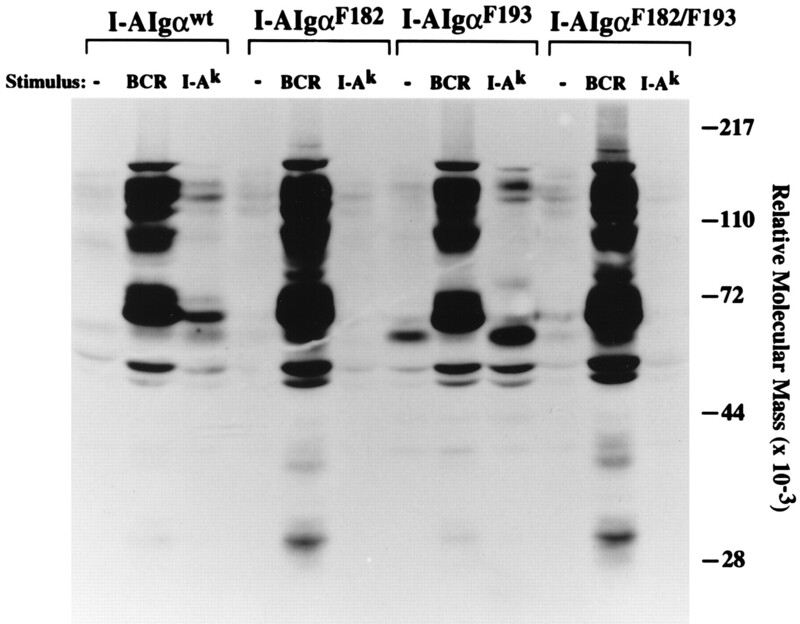 A, Ca2+ responses of cells expressing I-AIgαwt, I-AIgαF182, I-AIgαF193, and I-AIgαF182/193 (three panels each, arranged horizontally) upon stimulation through BCR, endogenous I-Ad, or chimeric receptors (I-Ak). B, Ca2+ responses of cells expressing I-AIgβwt, I-AIgβF195, I-AIgβF206, and I-AIgβF195/206 elicited through BCR, endogenous I-Ad, or chimeric receptors (I-Ak). 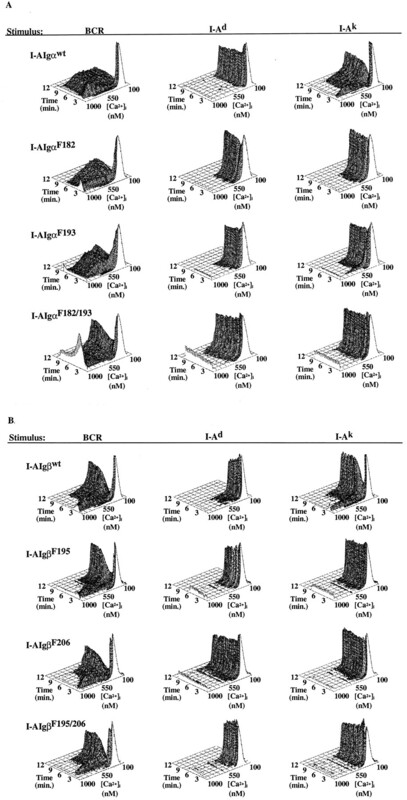 To assess the ability of the chimeric receptors to transduce signals leading to protein tyrosine phosphorylation, cells were stimulated with either F(ab′)2 of rabbit anti-mouse Ig Abs or anti-I-Akα mAb, 39J, and lysed in Nonidet P-40 lysis buffer. Protein tyrosyl phosphorylation of molecules in whole cell lysates or specific immunoprecipitated effectors was revealed by anti-phosphotyrosine immunoblotting. As shown, ligation of the chimeric I-AIgαwt or I-AIgβwt resulted in an increase in tyrosine phosphorylation of cellular proteins (Fig. 4⇓). These receptors were also capable of mediating tyrosine phosphorylation of Src family kinases Lyn, Fyn, and Blk and Syk kinase (Fig. 5⇓; data not shown). In parallel experiments it was shown that both chimeras also mediated phosphorylation of Shc and Vav (data not shown). Since I-Atr molecules were unable to mediate detectable protein tyrosyl phosphorylation, including the aforementioned signaling effectors, the observed signaling functions must reside within the cytoplasmic domains of CD79a and CD79b. Tyrosyl phosphorylation of total cellular proteins mediated by chimeric receptors, I-AIgαwt and I-AIgβwt. 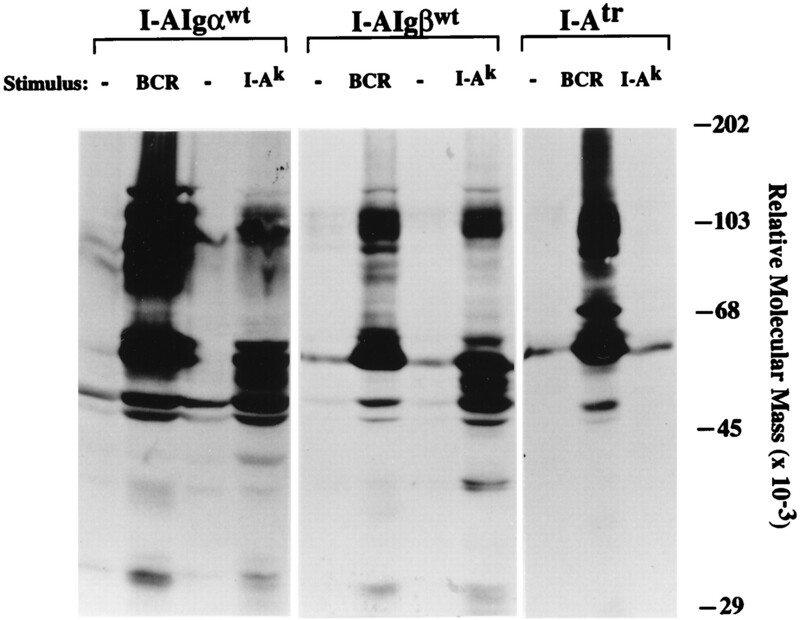 Cells (1 × 108/ml in PBS) expressing chimeric receptors I-AIgαwt or I-AIgβwt, or truncated I-Ak and I-Atr were either mock stimulated with PBS or stimulated with anti-Ig (1 μg/106 cells) or anti-I-Akα (4 μg/106 cells) for 2 min at 37°C. Cells were then lysed in Nonidet P-40 lysis buffer, and lysates equivalent to 2 × 106 cells/lane were loaded onto a SDS-PAGE gel. Fractionated proteins were transferred onto a PVDF membrane and immunoblotted with anti-phosphotyrosine Ab. Tyrosyl phosphorylation of Lyn, Syk, and chimeras upon aggregation of I-AIgαwt and I-AIgβwt. Cells (1 × 108/ml in PBS) expressing I-AIgαwt, I-AIgβwt, or I-Atr were either mock stimulated or stimulated with anti-Ig (1 μg/106 cells) or anti-I-Ak(4 μg/106 cells) for 2 min at 37°C. PTKs Lyn and Syk were individually immunoprecipitated from lysates (equivalent to 10 × 106 cells) using specific Abs. Chimeric I-AIgαwt and I-AIgβwt receptors were immunoprecipitated with anti-CD79a and anti-CD79b Abs (2 μl each of crude rabbit serum), respectively. CD79a was also immunoprecipitated from lysates of I-Atr-expressing cells. Tyrosine phosphorylation of these molecules was assessed by anti-phosphotyrosine immunoblotting. The same blots were then stripped of Ab and reprobed with anti-effector Abs to determine the amount of proteins in each immunoprecipitate (shown below each anti-phosphotyrosine immunoblot). Note that anti-Igβ (CD79b) Ab could not detectably immunoblot endogenous CD79b. Next, we examined whether the chimeric receptors themselves become tyrosine phosphorylated upon aggregation (Fig. 5⇑). Cross-linking of the chimeras led to their phosphorylation in a manner similar to that of mIg-associated CD79a-CD79b heterodimers upon BCR ligation. Surprisingly, mIg ligation led to some phosphorylation of chimeric receptors, but the inverse was not seen. This may be because the chimeric receptors are expressed at a higher copy number than endogenous BCR; thus, more of this substrate is available for BCR-activated kinases. Regardless, based on the parameters examined here, CD79a and CD79b appear equivalent in their ability to transduce signals. To determine the signaling function of each ITAM tyrosine in CD79a, chimeric molecules with phenylalanine substitution at the N-terminal ITAM tyrosine (F182), C-terminal ITAM tyrosine (F193), or both ITAM tyrosines (F182/193) were generated and expressed along with tail-less I-Aβ in M12.4g3r (Fig. 1⇑). Lines expressing chimeric I-AIgαF182, I-AIgαF193, or I-AIgαF182/193 molecules at their surface were isolated (Fig. 2⇑), and the signal transducing capability of these chimeras was assessed. As shown in Figure 3⇑, while mutation of Y182 led to a complete disruption of signaling leading to Ca2+ mobilization, F193 mutation still permitted a partial response. The observed defect in signaling is not intrinsic to the cells, since aggregation of endogenous BCR resulted in a robust Ca2+ mobilization. The ability of these chimeras to mediate tyrosyl phosphorylation of cellular proteins was also determined (Fig. 6⇓). Similar to the Ca2+ response, mutating Y182 prevented the signaling required for detectable tyrosyl phosphorylation of virtually all cellular proteins. In contrast, mutation of Y193 eliminated phosphorylation of some substrates but not others (e.g., Vav; data not shown). Notably, an unidentified 62-kDa substrate was more strongly phosphorylated in the mutant, while a prominent substrate seen at 68 kDa with IA-Igαwt was not phosphorylated. Thus, the second tyrosine in the ITAM of CD79a is not absolutely required for receptor-mediated protein kinase activation. For optimal Ca2+ mobilization, both tyrosines are essential. Tyrosyl phosphorylation of total cellular proteins mediated by mutated I-AIgα chimeric receptors, I-AIgαF182, I-AIgαF193, or I-AIgαF182/193. Cells (1 × 108/ml in PBS) were either mock stimulated with PBS or stimulated with anti-Ig(1 μg/106 cells) or anti-I-Akα (4 μg/106 cells) for 2 min at 37°C. Cleared lysates were fractionated by SDS-PAGE (equivalent to 2 × 106 cells/lane), transferred onto PVDF membrane, and immunoblotted with anti-phosphotyrosine Ab. To identify the kinase(s) responsible for signaling by the Y193 mutant leading to protein tyrosyl phosphorylation, the ability of the chimeras to mediate phosphorylation of Src family kinases Lyn, Fyn, and Blk, and Syk kinase was examined. Kinases were immunoprecipitated from unstimulated or anti-Ig- or anti-I-Ak-stimulated cells, and their tyrosyl phosphorylation was revealed by anti-phosphotyrosine immunoblotting. As shown in Figure 7⇓, detectable tyrosyl phosphorylation of Lyn appeared independent of ITAM tyrosines, since ligation of chimeras bearing either single or no ITAM tyrosines still resulted in kinase phosphorylation. Fyn and Blk behaved equivalently (data not shown). This suggests a mode of Src family kinase activation that is dependent on receptor ligation but independent of ITAM phosphorylation. Apparently, however, phosphorylation of substrates (other than ITAMs) requires ITAM tyrosines. Perhaps ITAM tyrosines must be phosphorylated to further activate Src family kinases or to recruit substrates that can then be phosphorylated. In contrast, mutating just one ITAM tyrosine to phenylalanine disrupted the ability of the chimeras to mediate Syk tyrosine phosphorylation (Fig. 7⇓). This finding is consistent with previous studies indicating that both SH2 domains are required for Syk family kinases to bind doubly phosphorylated ITAMs and to function in signaling (46, 47, 48). Tyrosyl phosphorylation of Lyn, Syk, and chimeras upon aggregation of I-AIgαF182, I-AIgαF193, or I-AIgαF182/193. Cells (1 × 108/ml in PBS) were either mock stimulated or stimulated with anti-Ig (1 μg/106 cells) or anti-I-Akα (4 μg/106 cells) for 2 min at 37°C. 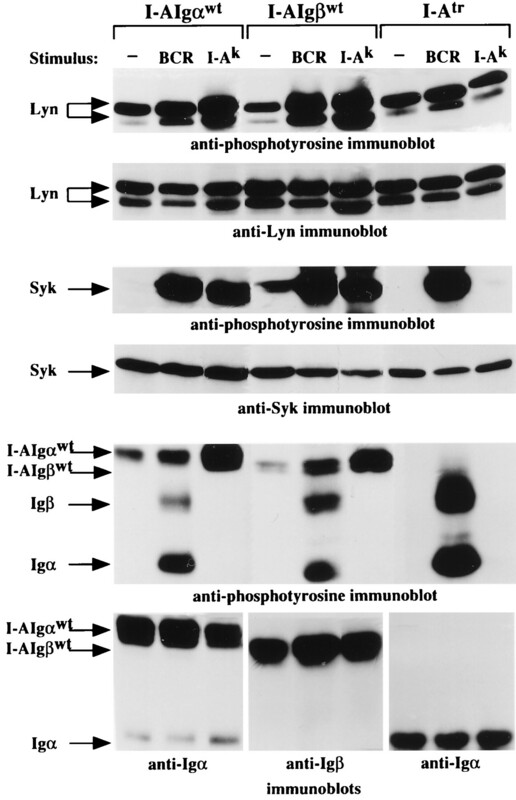 PTKs Lyn and Syk were individually immunoprecipitated from lysates (equivalent to 10 × 106 cells) using specific Abs. Chimeric I-AIgα receptors were immunoprecipitated with anti-CD79a Abs, which also immunoprecipitated the endogenous CD79a-CD79b complexes (not shown in the figure). Tyrosine phosphorylation of these molecules was assessed by anti-phosphotyrosine immunoblotting. 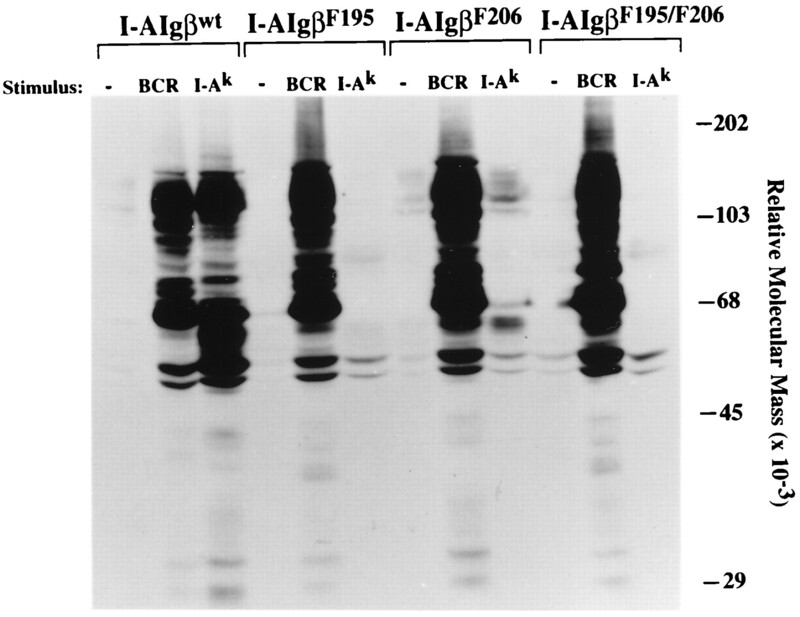 The same blots were then stripped of Ab and reprobed with anti-effector Abs to reveal the amount of protein in each immunoprecipitate (shown below each panel of anti-phosphotyrosine immunoblot). Since ITAM tyrosines are critical for ITAM signaling functions, we assessed tyrosyl phosphorylation of chimeras themselves upon aggregation (Fig. 7⇑). While I-AIgαF182 was barely phosphorylated, aggregation of the I-AIgαF193 chimera resulted in robust phosphorylation. As expected, no tyrosyl phosphorylation of I-AIgαF182/193 chimera could be detected. These data are consistent with the relative tyrosyl phosphorylation mediated by the chimeras and seen in whole cell lysates (Fig. 6⇑). These data suggest that in vivo, CD79a is primarily phosphorylated at the N-terminal ITAM tyrosyl residue, and this phosphotyrosine is likely to mediate the further activation of the kinases that phosphorylate other cellular substrates or mediate recruitment of substrates to the already active kinase. Since both tyrosines are reportedly necessary for the ITAM-mediated biologic responses that have been studied, it seems likely that both tyrosyl residues are phosphorylated in physiologic situations. Possibly, phosphorylation of Y193 may require preliminary phosphorylation of Y182, and for this reason, it is not seen in this model. To begin to address this possibility, we analyzed the tyrosyl specificity of ITAM phosphorylation in vitro (Fig. 8⇓). CD79a cytoplasmic tails expressed as GST fusion proteins were phosphorylated with [32P]ATP using baculovirus-expressed Lyn, Fyn, or Syk, and then analyzed by phosphopeptide mapping. While Syk failed to phosphorylate the fusion proteins (data not shown), both Lyn and Fyn phosphorylated the CD79a cytoplasmic portion of the fusion proteins well, with >80% of phosphorylation occurring at Y182 (Fig. 8⇓). These data further support the idea that Y182 is the primary site of CD79a phosphorylation by Src family kinases in vivo, and thus most phosphorylated ITAMs can only recruit effectors that can bind effectively via a single SH2 domain. In vitro mapping of tyrosine phosphorylation within CD79a and CD79b. 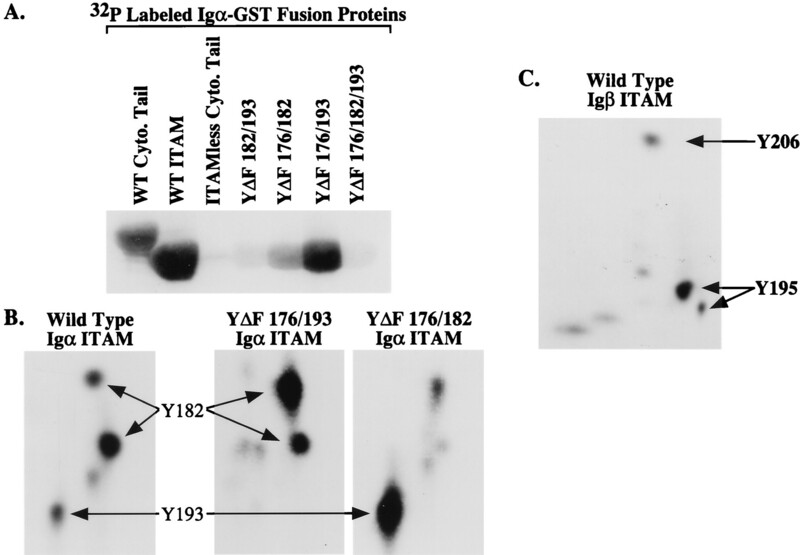 GST fusion proteins of wild-type (WT) CD79a (Igα) or CD79b (Igβ) cytoplasmic tails, WT ITAM, or mutated ITAMs with tyrosine to phenylalanine substitutions (YΔF) were phosphorylated in vitro with baculovirus-produced Fyn, fractionated by SDS-PAGE, electrophoretically transferred to PVDF membrane, and cleaved with thermolysin, and sites of phosphorylation were analyzed by two-dimensional TLC peptide mapping. A, Autoradiogram of in vitro phosphorylated GST fusion proteins fractionated by SDS-PAGE. B, Representative TLC peptide maps each loaded with 2500 counts of 32P-labeled and thermolysin-cleaved WT CD79a ITAM or YΔF ITAM fusion proteins. Maps of YΔF mutants illustrate how assignment of specific spots as being derived from specific phosphotyrosil residues was accomplished. Spots representing peptides containing Y182 or Y193 are indicated. C, Peptide map for WT CD79b ITAM. The positions of spots reflecting pY195 and pY206 in CD79b was also determined for YΔF mutants (data not shown). 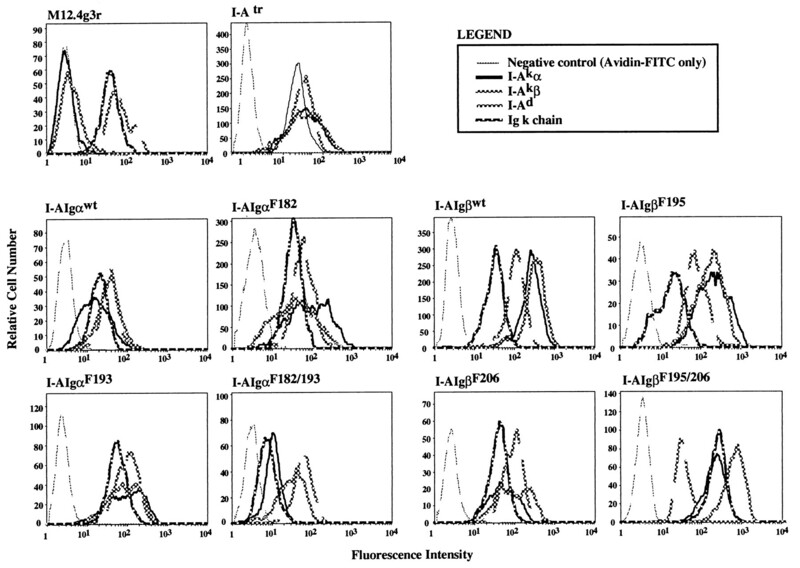 To assess the function of CD79b-ITAM tyrosyl residues, cell lines expressing I-AIgβ chimeras bearing various tyrosine mutation(s), namely I-AIgβF195, I-AIgβF206, and I-AIgβF195/206, were created (Figs. 1⇑ and 2⇑), and aggregation-induced phosphorylation and function of individual CD79b tyrosyl residues were examined. Analysis of Ca2+ mobilization mediated by these receptors revealed that single mutation of either tyrosine in CD79b has more severe functional consequences than in CD79a, as no response could be observed upon aggregation of either I-AIgβF195 or I-AIgβF206 receptors (Fig. 3⇑). In addition, neither single tyrosine mutant (nor the double tyrosine mutant) appeared competent to mediate tyrosyl phosphorylation of most proteins, including Shc and Vav (Fig. 9⇓; data not shown). I-AIgβF195 mediated no signal, and very weak, but significant, phosphorylation of 62kDa and substrates of approximately 110 kDa was seen in I-AIgβF206. Tyrosyl phosphorylation of total cellular proteins mediated by mutated I-AIgα chimeric receptors, I-AIgβF195, I-AIgβF206, and I-AIgβF195/206. Cells (1 × 108/ml in PBS) were either mock stimulated with PBS or stimulated with anti-Ig (1 μg/106 cells) or anti-I-Akα (4 μg/106 cells) for 2 min at 37°C. Lysates (2 × 106 cells/lane) were fractionated by SDS-PAGE, transferred onto a PVDF membrane, and immunoblotted with anti-phosphotyrosine Ab. The ability of I-AIgβ chimeras to mediate Src and Syk family kinase phosphorylation was also determined (Fig. 10⇓). Although mutated I-AIgβ chimeras failed to elicit detectable Ca2+ mobilization and most protein tyrosyl phosphorylation, Src family kinases were nevertheless tyrosyl phosphorylated upon receptor aggregation. Similar to that mediated by I-AIgα, I-AIgβ-mediated Syk tyrosyl phosphorylation required both ITAM tyrosines. Thus, for both I-AIgα and I-AIgβ chimeras, distinct tyrosine requirements for Src and Syk family kinase phosphorylation were observed. This implies that CD79a and CD79b ITAMs may mediate activation of the respective kinases via common mechanisms. Tyrosyl phosphorylation of Lyn, Syk, and chimeras upon aggregation of I-AIgβF195, I-AIgβF206, or I-AIgβF195/206. Cells (1 × 108/ml in PBS) were either mock stimulated or stimulated with anti-Ig (1 μg/106 cells) or anti-I-Ak (4 μg/106 cells) for 2 min at 37°C. PTKs Lyn and Syk were separately immunoprecipitated from lysates (equivalent to 20 × 106 cells) using specific Abs. Tyrosine phosphorylation of these molecules was assessed by anti-phosphotyrosine immunoblotting, followed by reprobing with anti-effector Abs to reveal the amount of proteins in each lane (shown below anti-phosphotyrosine immunoblot). 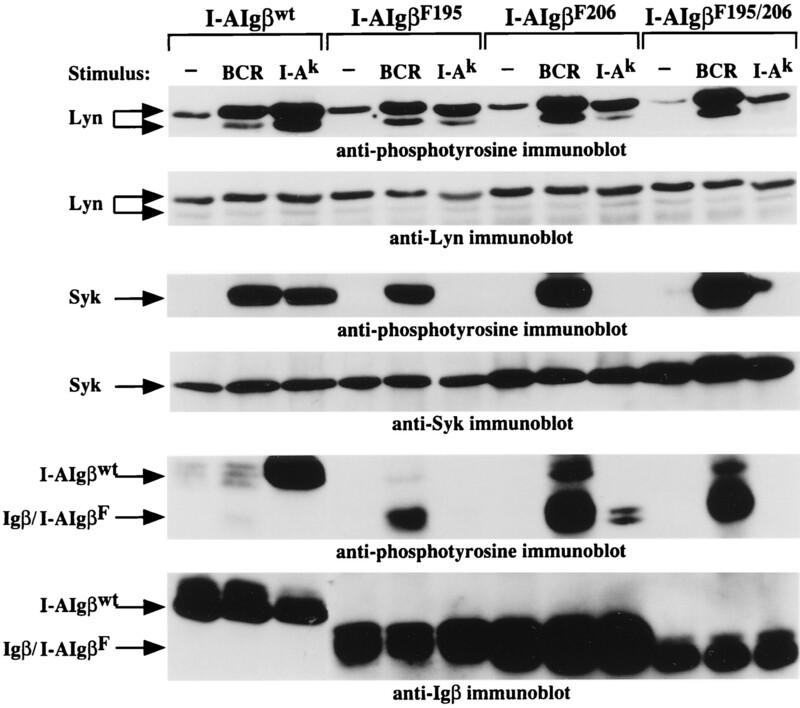 Similarly, tyrosine phosphorylation of anti-CD79b Ab-immunoprecipitated chimeric I-AIgβ receptors was examined by immunoblotting. The amount of I-AIgβ in each lane was determined by subsequent immunoblotting with anti-CD79b Ab, which does not detectably immunoblot endogenous CD79b. The chimeras with a tyrosine to phenylalanine mutation(s) migrated to approximately the same position on the SDS-PAGE gel as endogenous CD79b. The effect of tyrosine mutation on I-AIgβ tyrosyl phosphorylation was examined next. It is noteworthy that, as shown in Figure 10⇑, the I-AIgβwt chimera migrates more slowly than the mutants, whose mobility is the same as that of endogenous Igβ. The structural basis of this differential mobility is unknown. 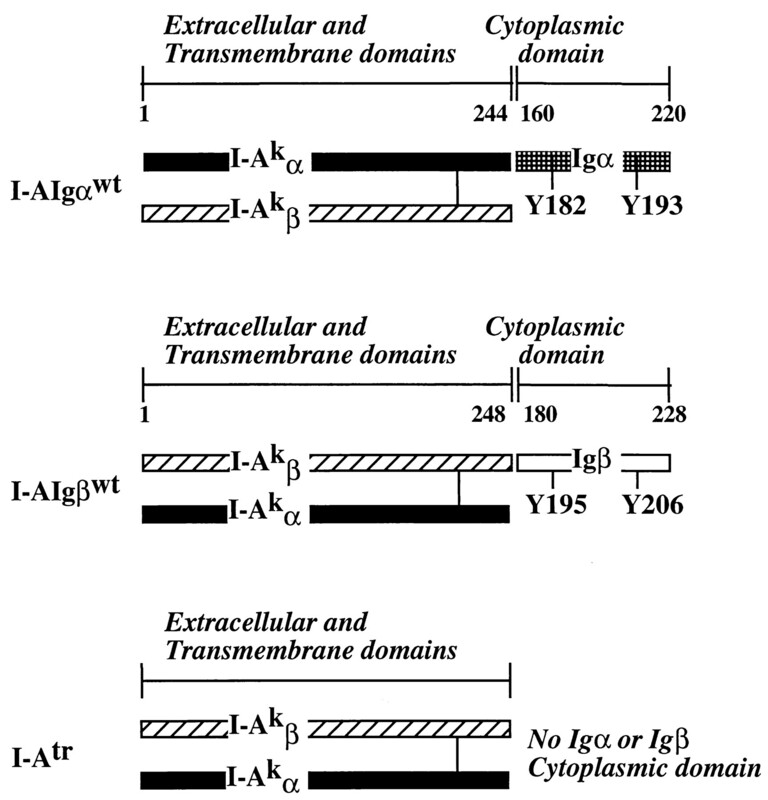 Regardless, the results indicate that phosphorylation of I-AIgβ chimeras is largely dependent on the presence of both tyrosines, since no phosphorylation of I-AIgβF195 was seen, and phosphorylation of I-AIgβF206 was only barely detectable. This result again distinguishes I-AIgβ from the I-AIgα chimeras, in that the C-terminal ITAM tyrosine mutation in the latter did not prevent robust chimera tyrosyl phosphorylation, indicating that phosphorylation of CD79a-and CD79-ITAMs is differently regulated. Y182 of CD79a may be more efficiently phosphorylated and functional, simply because, as predicted by Schmitz et al. (41), it is a better substrate for Lyn (and Blk). Interestingly, when CD79b cytoplasmic tail-containing GST fusion proteins were phosphorylated in vitro by baculovirus-produced Fyn, >80% of phosphorylation occurred on the N-terminal ITAM tyrosine, as in CD79a fusion proteins (Fig. 8⇑). Thus, the CD79b-ITAM can serve as a substrate for Src family kinases, and the N-terminal tyrosine is preferred. Using CD79a and CD79b cytoplasmic tails expressed independently as fused chimeric receptors with α- or β-chain of MHC class II molecules, we analyzed various molecular signaling functions of CD79a and CD79b with regard to the occurrence and functional consequences of ITAM tyrosyl phosphorylation. The results indicate that in both CD79a and CD79b, ITAM tyrosines are asymmetrically phosphorylated during BCR signal transduction. The N-terminal tyrosine appears to be the preferred site of phosphorylation of both chains. Consistent with its preferred phosphorylation, Y182 in the CD79a-ITAM appears to be particularly important in terms of function. Phenylalanine substitution at this position effectively abolished all detectable tyrosyl phosphorylation of the receptor and other substrates, except Src family kinases, and prevented Ca2+ mobilization mediated by the chimeric receptor. Mutating Y193 had a distinct effect on phosphorylation and function. Phosphorylation of certain substrates, including p62 and the receptor itself, was seen, and the Ca2+ mobilization response was only partially disrupted. Similar differences between the respective tyrosine mutants were observed with CD79b; however, the effect of mutating the C-terminal tyrosine was more severe, further quantitatively reducing p62 and receptor phosphorylation and preventing Ca2+ mobilization. For both CD79a and CD79b, neither tyrosyl residue was required for Src family kinase phosphorylation, but both were required for Syk phosphorylation. These findings lead to several conclusions regarding molecular mechanisms in BCR signaling. One of the important conclusions of this work relates to the role of ITAM phosphorylation in kinase activation. Detectable (but generally not maximal) phosphorylation of Src family kinases appeared to not depend absolutely on either conserved ITAM tyrosine, supporting the possibility that these kinases are partially activated by aggregation of receptors to which they are tethered by virtue of kinase-unique region interactions with nonphosphorylated ITAMs (39, 49). The results described here also indicate that phosphorylation of ITAMs, at least Y182, may drive further activation of Src family kinases that now phosphorylate downstream targets. Alternatively, or more likely additionally, phosphorylated ITAMs may focus substrates to the already active kinase, which then phosphorylates them. Phosphorylation of both ITAM tyrosyl residues is required for Syk phosphorylation, presumably reflecting a previously demonstrated requirement that both SH2 domains must be functional for Syk to act in BCR signaling (50). 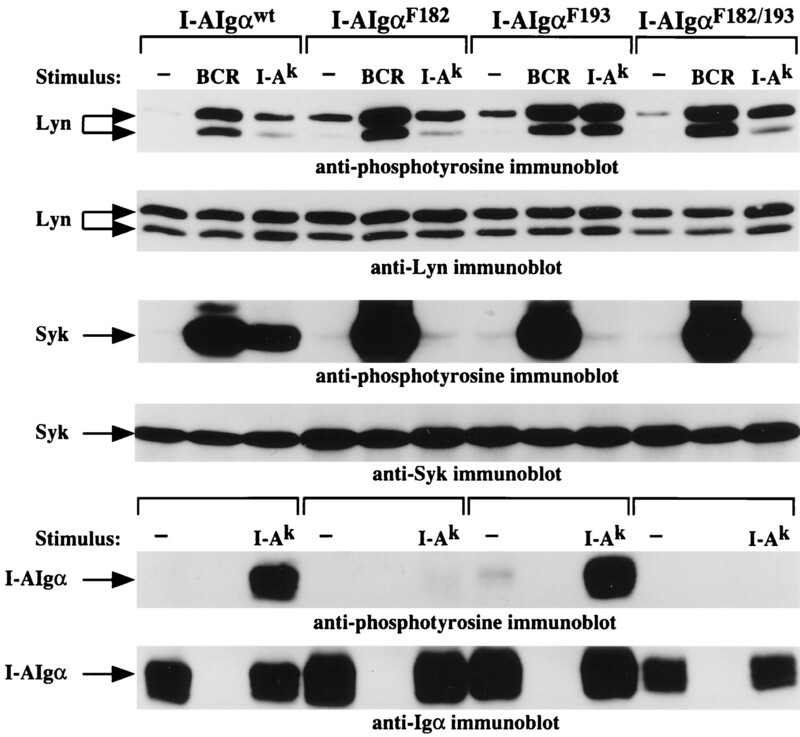 It is noteworthy that binding to biphosphorylated ITAMs reportedly activates Syk (47, 48). As supported by the findings reported here and from other studies, initial receptor phosphorylation is most likely mediated by Src family kinases. Analyses of Lck-deficient variants of Jurkat cell line (51, 52) and studies of COS cells reconstituted with receptor components and kinases (33) both indicate the necessity of Src family kinase activity in ITAM phosphorylation. Consistent with this, phosphorylation of Src family kinases was independent of CD79a and CD79b ITAM tyrosyl residues in the model presented here as well as in another model where CD79b was expressed in T cells (53). Thus, by virtue of their association with the resting receptors (37, 39, 49), Src family kinases probably subserve the role of endogenous kinase activity in growth factor receptors, functioning to quickly phosphorylate receptor tyrosines upon BCR aggregation, resulting in recruitment of other effectors (37, 54). Y182 of CD79a appears to be the initial and preferred site of Ag receptor phosphorylation by Src family kinases. In vitro, Src family Lyn and Fyn predominantly phosphorylate this residue in CD79a, and Y195 does so in CD79 (35) (this study). Examination of phosphorylation of I-AIgα chimeras (this study) and that of CD79a-CD79b heterodimers expressed as a part of BCR complex in J558L cells (35) also suggests the same substrate preference in vivo. However, the possibility that the presence of Y183 is somehow necessary for phosphorylation of Y193 in vivo cannot be excluded. This possibility is excluded in vitro, since both tyrosil residues are present in the substrate. Other features of nonphosphorylated CD79a ITAM support the idea that Y182 may be the preferred substrate of Src family kinases. First, CD79a appears to have higher affinity for Src family kinases than CD79b (37). Secondly, analysis of kinase substrate specificity using phage display has revealed that Src family kinases Blk and Lyn prefer substrate peptides with sequence I/L-Y-D/E-x-L (41). This consensus is found in Y182 of CD79a, in the context of L-Y182-E-G-L, but not in CD79b. Thus, Src family kinases are selectively tethered to CD79a, where their optimal substrate sequence is located. Nonetheless, until phosphorylation of CD79a and CD79b is mapped in wild-type receptors, the relative phosphorylation of various ITAM tyrosil residues in physiologic settings cannot be firmly established. Phosphorylation of Y182 in CD79a appears to play a critical role in signal propagation. As reported here, phosphorylation of Y182 alone can lead to further kinase activation and/or effector focusing necessary for phosphorylation of certain downstream targets, such as p62, p110, and Shc, but not others, such as Vav. As discussed earlier, phosphorylation of both tyrosines in a single ITAM seems necessary for Syk activation and full receptor function. Activation of Syk may be mediated solely as a consequence of tandem SH2 binding to a biphosphorylated ITAM, by Src family kinase-mediated phosphorylation of Syk, or by both (48, 55). One of the surprising findings reported here is that activation of Ca2+ mobilization can be demonstrated under conditions in which Syk activation should not and apparently does not occur. Syk kinases are thought to phosphorylate and activate PLCγ, as they engage the SH2 domain of the lipase (56, 57). Consistent with this possibility, PLCγ2 phosphorylation was not observed in the absence of detectable Syk activation (data not shown). However, cross-linking of I-AIgαF193 resulted in detectable Ca2+ mobilization despite the absence of detectable Syk phosphorylation. Perhaps a Syk- and PLCγ-independent Ca2+ mobilization pathway can be activated by I-AIgαF193 chimeras. However, partial Syk activation as a result of interaction with two trans-occurring phosphotyrosyl residues in aggregated I-AIgαF193 receptors cannot be excluded. Finally, the results described here support the possibility that BCR phosphorylation is an ordered process involving initial phosphorylation of CD79a-Y182 followed, perhaps, by CD79b-Y195 and then the C-terminal tyrosines. The extent to which the sequence is completed may depend, for example, on the duration of receptor occupancy, more specifically on the Ag off-rate. The higher the off-rate, the more limited the progression through the phosphorylation program and, as a consequence, the more limited the spectra of effectors activated. Such a mechanism may provide a molecular basis by which cells make distinct biologic responses to high and low affinity Ags. Further studies using heterodimeric chimeras and ligands with varying affinities will be required to address this hypothesis. ↵1 Address correspondence and reprint requests to Dr. John C. Cambier, Division of Basic Sciences, Department of Pediatrics, NJCIRM, 1400 Jackson St., Denver, CO 80206. ↵2 Abbreviations used in this paper: BCR, B cell Ag receptor; mIg, membrane Ig; PTK, protein tyrosine kinase; PLCγ, phospholipase Cγ; ITAM, immunoreceptor tyrosine-based activation motif; IMDM, Iscove’s modified Dulbecco’s medium; PVDF, polyvinylidene difluoride; TBS, Tris-buffered saline; GST, glutathione-S-transferase.